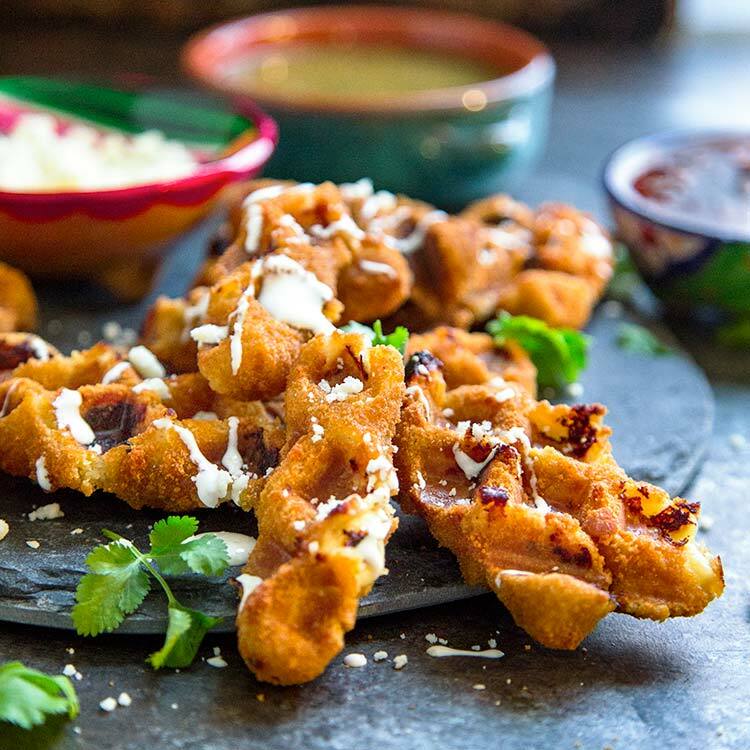 This is one of those recipe posts that involves the use of leftovers. 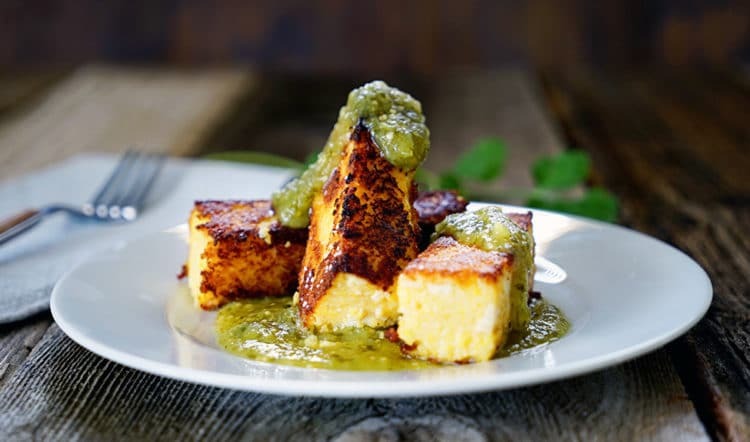 Easy enough and so good just on it’s own I say, these Chicken Polenta Sticks with Tomatillo Salsa Verde were awesome in taste, texture and simplicity. Just the other evening I was in the mood for some smooth, cheesy polenta. You ever feel the need for a specific food and must have it? Well I had just picked up a rotisserie chicken and decided to shred it up and add that in for a Comfort Meal 101 dinner with a nice salad. Not only did it hit the spot, but I made enough for leftovers. What I love about polenta is pouring the leftovers in a greased dish and then refrigerating it. It hardens and you can slice it up, pan fry it and have another meal entirely. More bang for your buck! That’s where the idea for these Chicken Polenta Sticks with Tomatillo Salsa Verde came from. I had some fresh tomatillo salsa on hand that I made for enchiladas that I froze. One’s got to plan ahead for nights I don’t want to cook. I just pull the frozen enchiladas out of the freezer before heading to work, come home and they’re thawed and ready heat up. Well for these I simply cut up the hardened polenta, dusted them with a little flour and pan fried them. There was a bit of spluttering, but minimal. What came out were there wonderful, crunchy on the outside and soft, creamy and cheesy on the inside polenta sticks. All the Parmesan cheese in the polenta got caramelized and crunchy good on the edges. Plus, these had the added bonus of being fortified with shredded chicken. I draped them with some tomatillo green salsa and we were in heaven. 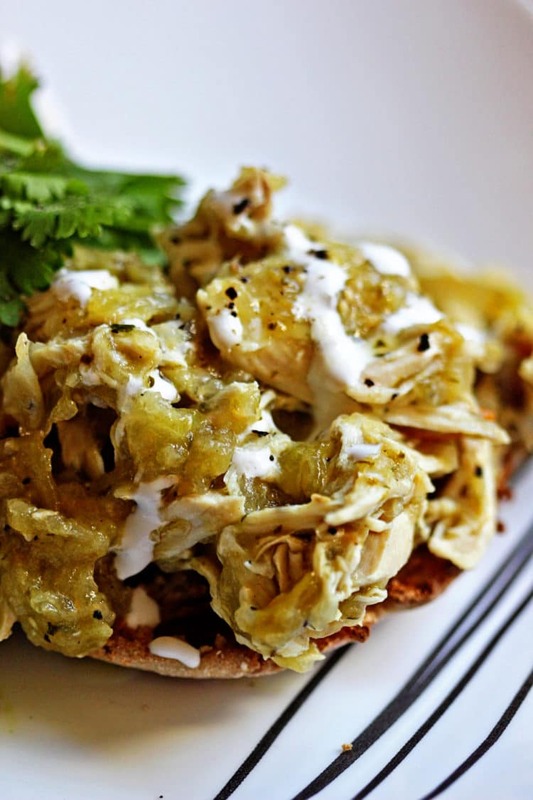 Tomatillos are a fantastic ingredient used in Mexican cooking that lends a wonderful flavor and heat. I use them all the time, like in my Open Faced Pollo Verde Sandwich, my Tomatillo Green Chile Pork Stew and Chili Lime Rubbed Grilled Flank Steak with Roasted Tomatillo Salsa to name a few. 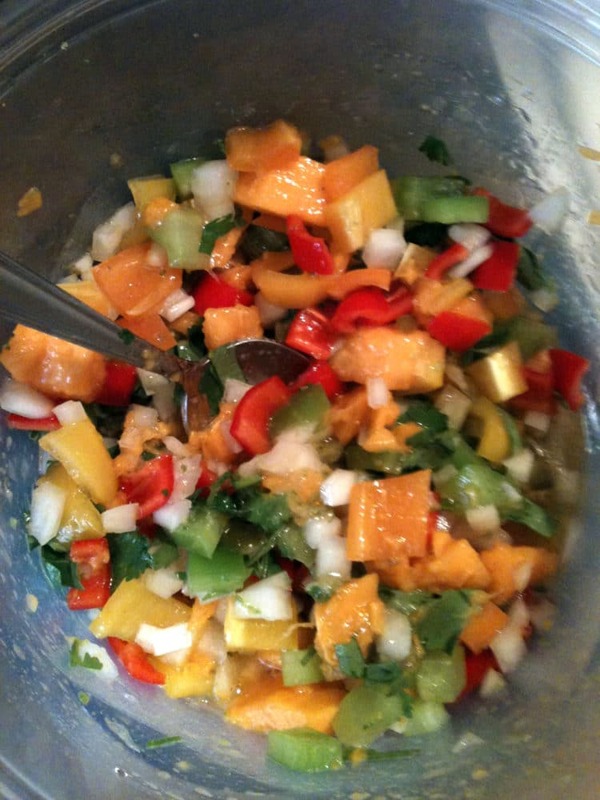 Feel free to use my recipe for the tomatillo salsa or your favorite. Enjoy! Chicken Polenta Sticks. 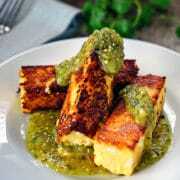 Leftover polenta with shredded chicken gets chilled, cut and pan fried until crispy brown and draped in a tomatillo salsa verde. In a large stock pot bring the 3 cups of water up to a boil. Using a balloon whisk, slowly pour the dry polenta in boiling water and whisk to avoid lumps. Cook on low for 10 minutes. This will sputter so keep on low and watch out. Add the heavy cream, black pepper, grated Romano and Parmesan cheeses. Stir to incorporate. Add the shredded chicken and stir to incorporate. Simmer for another 15 minutes more. If it gets too thick you can thin it out with more water or chicken stock to your liking. Season to taste and take off the heat. Eat as is or pour immediately into a greased 9x9” pan and refrigerate to firm up and make Chicken Polenta Sticks. Refrigerate for several hours until firm and cooled. 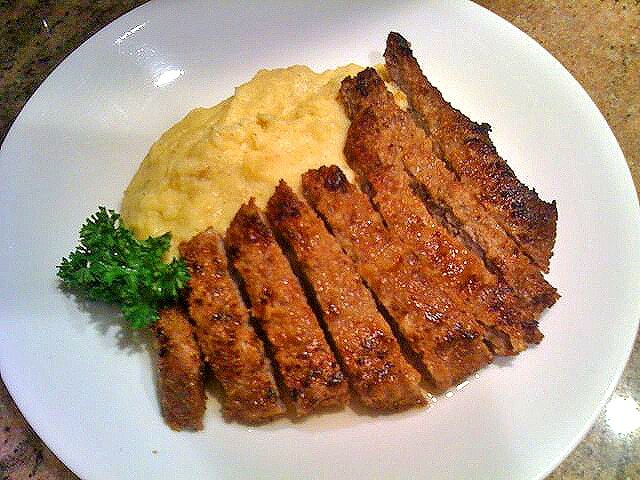 Slice the chilled and firm polenta into 12 sticks. Work in batches to not overcrowd the pan and steam them. Dust all sides with flour and pan fry until crispy brown on all edges. 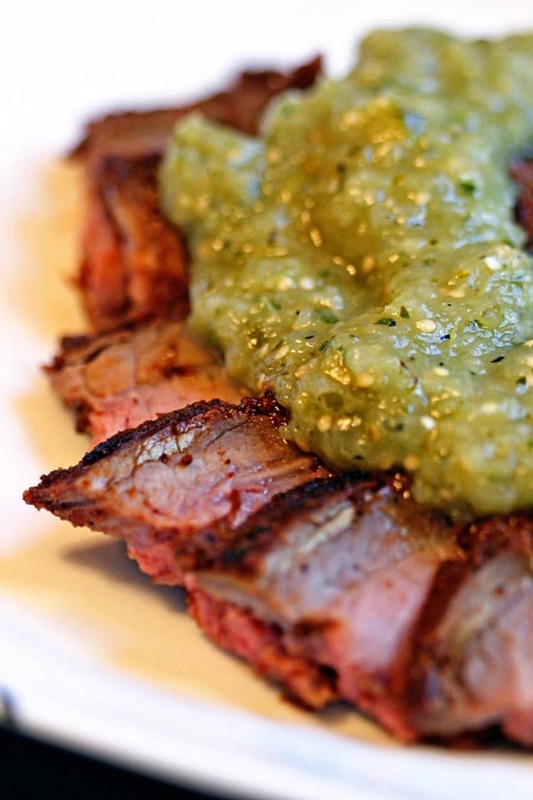 Serve with Tomatillo Salsa Verde. I think I just found a use for the tinned tomatillos I have left over from another recipe. Sadly fresh ones are tricky to find here in Sydney, even when they’re in season. Your polenta looks sensational! Hey there John, thanks so much! Been a fan of your photography for a while now thanks to a common friend (Nagi) and the FBC group. I am lucky being next to Mexico here in San Diego. Southern California is big on chiles so I’m always working up new ways for their use. As for those polenta sticks, they are a favorite, so whenever I make polenta I double batch it for these bad boys. Cheers and thanks for stopping by. I love, love polenta, but Keith is not a fan – adding chicken may just push him over to my side. This is a must try! While polenta is usually served while still warm and loose (which I love) this is firmed, cut and pan fried to get crispy. Hopefully he’ll give it a shot with the different texture? I’ve got a polenta recipe coming out tomorrow … great minds think alike! I love that you’ve added chicken. 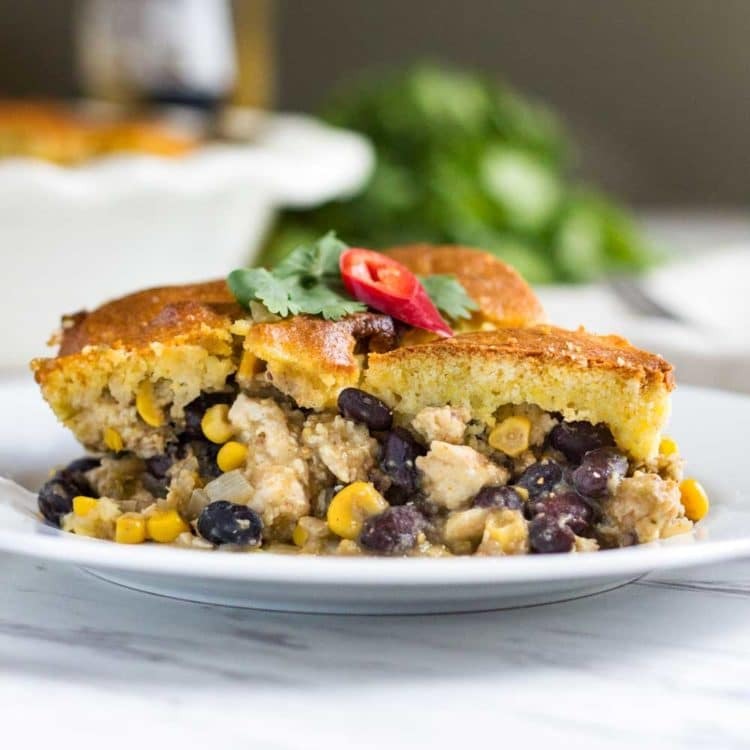 Such a great way to use some of the leftovers from rotisserie chicken! Kristen, thanks again for letting me know about the pop up ads. That horrible hacking and subsequent hosting server move had to happen (story in tomorrow’s post). Glad to be back responding to comments and posting again. Note: Remember to change you passwords and make them crazy long! Okay – I’m a big fan of polenta (see today’s post – ha!) but have never had it with chicken! I love your creativity Kevin! This looks divine! Especially with those golden fried edges! Thanks Annie! Sorry if you experienced pop up ads when you came to my sight. I have since moved hosting servers, changed and updated passwords and am back responding to comments and posting again. What an ordeal. You had me at “Parmesan cheese in the polenta got caramelized and crunchy good on the edges.” There’s something so incredibly comforting about polenta and cheese, especially when it gets crunchy and caramelized. 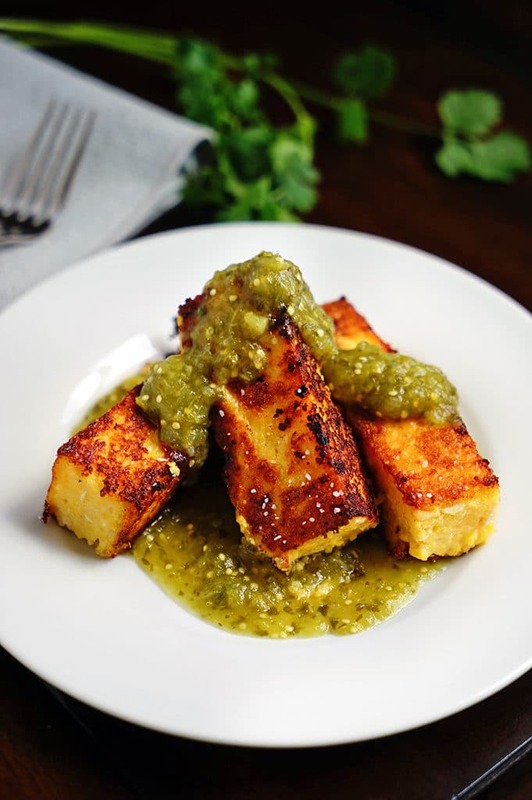 I also love the tomatillo salsa, such a good contrast of flavors. So good, Comfort Food 101 for sure Mike. So sorry for the pop up ads, that was associated with the malware code a hacker inserted in my site. I moved to another hosting server and had the site cleaned. A hacker from Turkey and another from the Ukraine got in and placed malicious code and pop up ad code in my parent theme and posts. It was hell – so make note, and change your passwords (or make them crazy long). It’s been a while now and I’m so glad to be back responding to comments and posting again. I’ve never made fried polenta on my own, Kevin. This looks fantastic, and I’ve got a million ideas in my head how to garnish it up. Dusting with flour sounds like a smart idea too. I should make it. Hopefully, I won’t make havocinthekitchen haha:) Pinned! By the way, I wasn’t able to pin it – instead of opening the Pinterest I’ve had some suspicious pop up windows. This might be related to your recent issues – hope that help to fix it. Sorry for the pop up ads, that was associated with the malware code a hacker inserted in my site. All is good now so PLEASE, Pin away! Remember to update and change your passwords often, it has really been a nightmare (read tomorrow’s post!). Hi Ben and thank you. The chicken is IN the polenta!! I didn’t realise, I was searching for it in the photos!! Wow Kevin, I really love this!! Sharing! Thanks Nagi, YES the chicken is in the polenta! It seems like forever since I’ve been able to do anything with my site with the hacking and am so glad to be back and respond to comments. Really looking forward to our FBC group meeting coming up. I booked tickets for both Dave and I.
Hi Dorothy! I tried emailing you several times and it bounced back. Wanted to check on you and see how your back was doing? I have moved my site to another hosting server, changed all passwords and the site is back up after that horrible hacking experience. Look out for my new post tomorrow, I’m back! 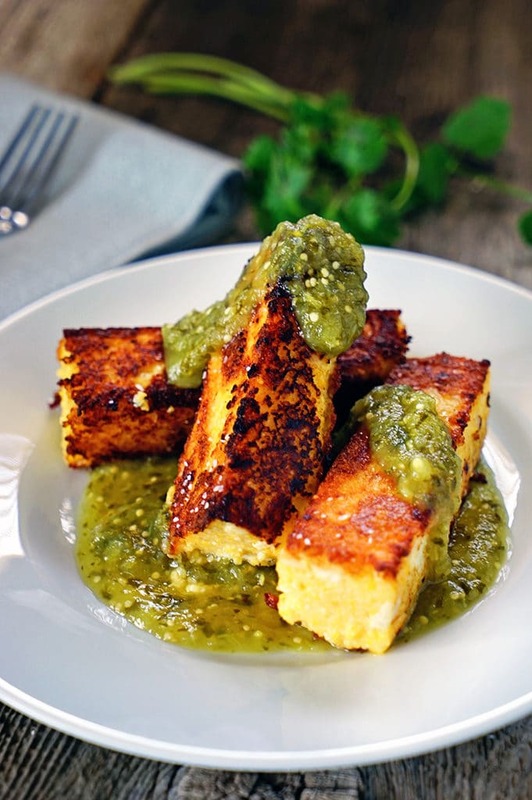 Fried polenta is definitely a favorite here…but I’ve never tried making it myself. 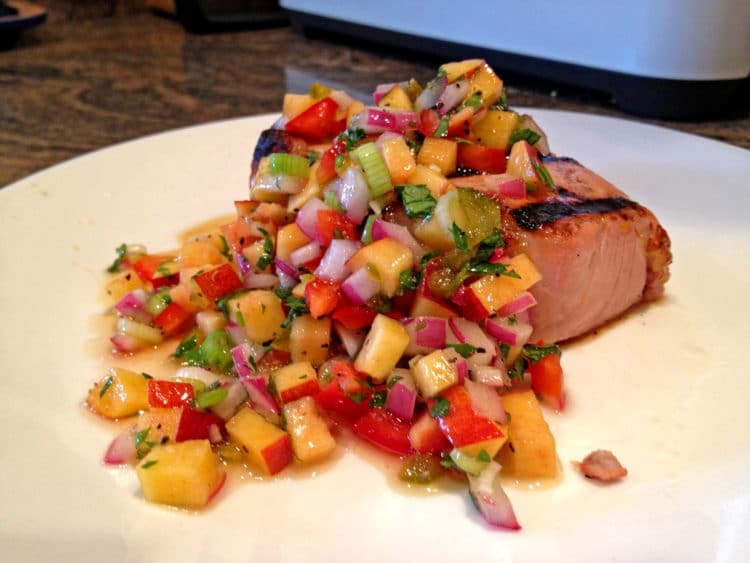 I love the sticks idea…and that tomatilla salsa. Umm, just hand me a spoon for that salsa! Love this one, Kevin! Thanks Dave. My first attempt at pan frying was a sputtering mess, but the next attempt I found dusting with the flour was key. Tasty stuff and the salsa is a house favorite!